Bobcat is a multinational manufacturing company of construction equipment, specializing in skid steer loaders. The company was founded by Melroe Manufacturing, which itself was established in 1947 in Gwinner, North Dakota. The Bobcat name was first used in 1962 on the company’s newly introduced skid steers. Melroe was purchased by Clark Equipment Company in 1969, Ingersoll Rand Company in 1995, and Doosan Infrastructure in 2007. The Bismarck manufacturing plant had opened in 1974. 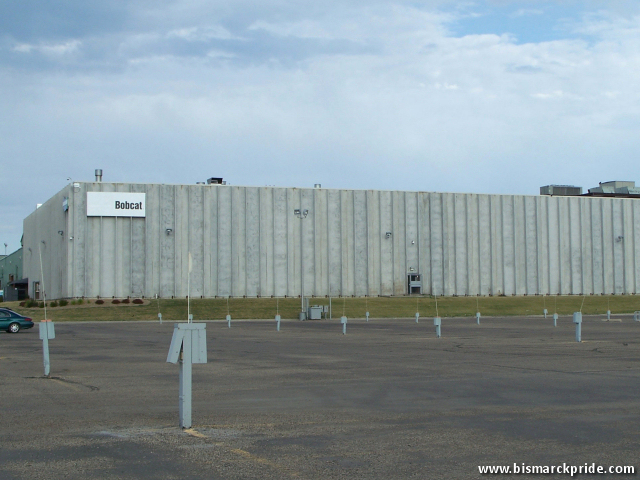 On September 2, 2009, it was announced that the Bismarck plant would close by year-end, in a cost-saving effort to consolidate North Dakota operations into its Gwinner plant. The move resulted in the termination of approximately 475 jobs in the Bismarck-Mandan area. The plant’s last day of operation was on December 23, 2009. On April 17, 2012, Bobcat announced plans to add about 200 total new jobs to Bismarck, just over two years following the closure of its plant. In April 2013, Bobcat unveiled the completion of a $6.5 million renovation of its Bismarck plant after adding 600 local jobs. Bobcat had been such an important factor for the Bismarck-Mandan economy that the local NAHL hockey team, Bismarck Bobcats, was named in the company’s honor.